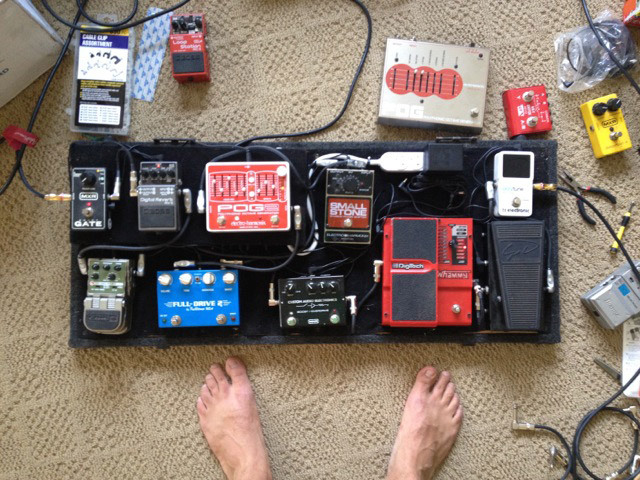 Today’s pedal line is from Colin James Robson. If you have a pedal line (doesn’t have to be in a board) for your rig, please email me a photo, bio, description of pedals and routing to pedalline@nulleffectsbay.com. Every Friday I’ll showcase a pedal line submission. Make sure you include any links to your band or music page. This is my current, simplified pedalboard for a project I’m working on. I am a guitar player and producer who recently moved from New York City to pursue a passion project of building a recording studio on the beach in beautiful Pacific City, Oregon. My partner Andrew Russell (@theroo0132) and I, Colin James Robson (@colin__james) founded Kiwanda Sound Recordings after some successful composition work and a Kickstarter project. You can find out more about the studio, our projects, live session videos, and DIY studio build tips at kiwandasound.com, Facebook, and Twitter. It’s all powered by the Voodoo Labs Pedal Power 2. I used Planet Waves Cable Station to connect most everything, and Monster Rock instrument cables between my Jazzmaster Classic Player and Fender Deville 410 with white tolex and oxblood grill. Cable clips from Harbor Freight Tools helped organize some of this. Also, bare feet are essential for multi-toe switching like a PRO. Check out my previous Pedal Line Friday feature and the rest of the studio gear at kiwandasound.com/gear.